One of my pen pals from the German pen pal site Letternet is also a cat lover, and an excellent artist! I love the perspective of the cat whimsically batting from above. Another cat said goodbye at the closing. 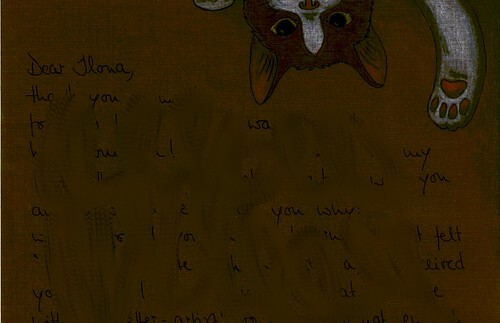 The use of white on the brown paper is really cool, I think, and I was thoroughly charmed by her feline artwork on this letter. It even had a cat to hold my address on the envelope! 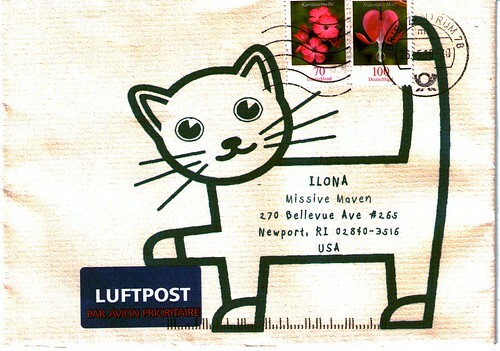 Note the cat is holding down the Luftpost sticker... good move, as we all know air mail is prone to flying away. Speaking of flying away... I've removed my sent statistics. They served their purpose as an interesting experiment and examination, but I feel they've taken the focus away from the letters themselves. It doesn't matter how many letters we write, just that we are writing them... don't you think? I agree! We do what we can. Love that paw holding down the airmail sticker. Beautiful letter art. Yes, I agree about stats. At the end of the day, every letter lover is probably writing lots of letters. I prefer not to count them. yes I agree writing the letter is the most important thing after all . Just wanted to say I am really jealous on your blog! It looks awesom. Translated it means: letters to no one else. I will follow you and maybe I can learn from you. Sikko, thank you for the compliments, and good luck with your blog. Love the cat theme letter you received. I agree about not continuing to add the number count on how many letters and postcards etc. The fun part is just receiving them no matter if it's a letter or a postcard.